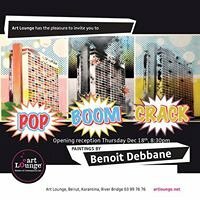 Art Lounge presents new paintings by Benoit Debbane inspired by Beirut and the current political and security climate in Lebanon & the region. Once again Benoit surprises his audience with an explosive body of work, filled with an unparalleled creative energy and wall power that is hardly matched. Come discover for yourself new dynamic & exclusive paintings on canvas starting Dec. 18th 8hp.m.